View from the shower towards the master bedroom. Canale Grande is located on a sailboat access canal. Front elevation of Canale Grande. Vaulted ceilings and a spectacular entrance. Formal dining for six guests. Open kitchen with wood cabinets and granite counter tops. The kitchen features stainless steel appliances. Spectacular view out to the swimming pool and lanai while preparing meals in the kitchen. Colorful furnishings in the living room. View of the living room from the guest bedroom. View of the living room from the formal dining room. The master bedroom features a king size bed as well as a private sitting area. View of the master bedroom from the private sitting area. The master bathroom features dual sinks, jetted tub and separate toilet. Master bathroom at Canale Grande. The second guest bedroom features a queen size bed. Second guest bedroom. The guest bathroom also serves as a pool bath. The third bedroom is right next to bedroom 2. Guest bedroom 3 is looking out to the front of the house. This vacation rental features a large under truss lanai sitting area. Large screened in pool deck with pavers. The swimming pool is electrically heated. From this property the open water can be reached within 20 minutes. Concrete captains walk behind the house. Located South of Cape Coral Pkwy on a Sailboat Access canal, quiet & pristine neighborhood, this property features the typical Florida Lifestyle, vaulted ceilings, large sliding glass doors, lots of windows and daylight, split floor plan with a magnificent master suite, large bathroom with dual sinks, jetted tub and walk in shower, guest bedrooms feature 2 twin beds, and the other two guest suites feature 1 queen size bed each. Fully equipped kitchen with all necessary kitchen utensils and equipment needed to prepare meals, outside lanai features a paver pool deck, electric heated swimming pool, captains walk by the canal as well as a tiki hut to sit and relax at. Suedlich von dem Cape Coral Pkwy gelegen, Segelboot Zugang, 4 Schlafzimmer & 2 Baeder mit sehr hohen Decken, viel Tageslicht, offene Kueche mit allen notwendigen Kuechengeraeten, riessiges Master Schlafzimmer mit Bad, 2 Waschbecken, Badewanne sowie begehbare Dusche, die anderen 3 Schlafzimmer verfuegen ueber 3 Queen Size Betten . Der grosse Terassen Bereich ist mit Pflastersteinen ausgestattet, Swimming Pool ist elektrisch beheizt, Captains Walk mit Tiki Hut steht zur Verfuegung. Great house! Great location! Great pool and dock on the canal! Very clean and comfortable! 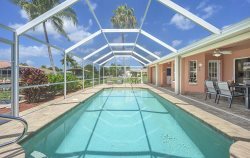 Would recommend it to all that want a vacation home in Cape Coral! We would rent from Vesteva again in a heartbeat. Simply amazing. Vanessa and Bob where extremely friendly. I would definitely rent from Vesteva again! Simply amazing. Vanessa and Bob where extremely friendly. I would definitely rent from Vesteva again! Great equipment house with everything possible that you may need on vacation. Great communication with management. Easy to find, easy to check in. Comfy beds, welcoming atmosphere and really beautiful view with awesome warm swimming pool. Very private but also central to town. This house looks better than on pictures and has everything possible that you may need to really enjoy your vacation. We will definitely go back and we are strongly recommending this house to everyone. Thank you. Great and quiet neighborhood. Reservation, payment, check-in and check-out was very smooth and easy. Good information about the procedures before the check in and when Vanessa warmly welcomed us. Steffen handled the check out nice and swift. We had a wonderful vacation and Christmas staying at Canal Grande in Cape Coral. The house was spacy and clean, the beds very comfy. We enjoyed the house a lot. And on top of all the weather was fantastic, most days the temperature outside was above 85 degrees. So there where no need to heat the pool. When we where at the house our youngest daughter (10y) spent most of her time in the pool. Sanibel beach was fantastic. The home is very grandiose, love the location and the amenities.